With nerdiness at a particularly high popularity (seriously, 10-20 years ago, comic book super heros, sci-fi, and such were lame but now everyone loves them), it's not uncommon for people to have their own little ideas about what is going on in the background of their favorite fandoms. These are typically referred to as headcanon and here are a few of the ones I subscribe to. 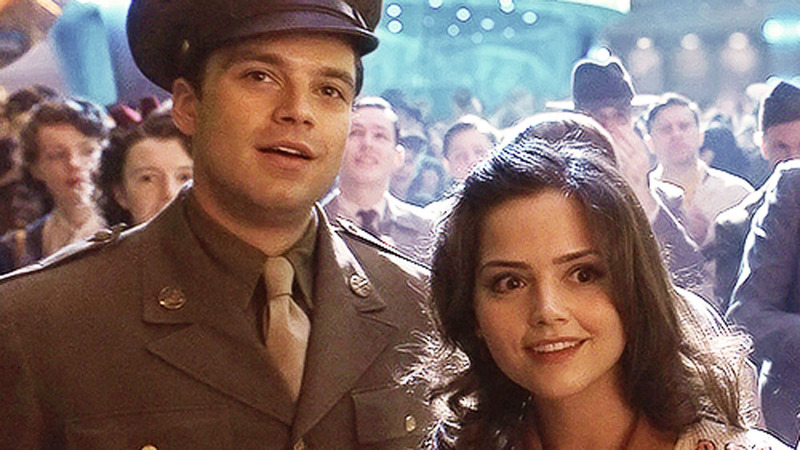 Remember in “Captain America: The First Avenger” when Bucky set up a double date for himself and Steve? Jenna Coleman played one of the dates, Connie. A dismissal role for a non-Whovian as you barely even see her in the movie. But to a Whovian, you’ll recall that she later played Clara Oswald, companion to the 11th and 12th Doctor. And about that, remember in “The Name of the Doctor” when Clara Oswald enters the Doctor’s time stream and starts being born all over time? Gallifrey, Victorian London, the Dalek Asylum, and many more. 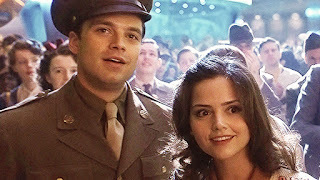 What if one of those splinters lived in NYC in 1942 and just happened to meet Captain America? Another one for you: remember in the musical episode of Once Upon a Time when Zelena broke into song? She was in Oz, so I was surprised she'd be affected by Snow's wish. But what if she wasn't affected by the wish? What if Zelena is just that fabulous? 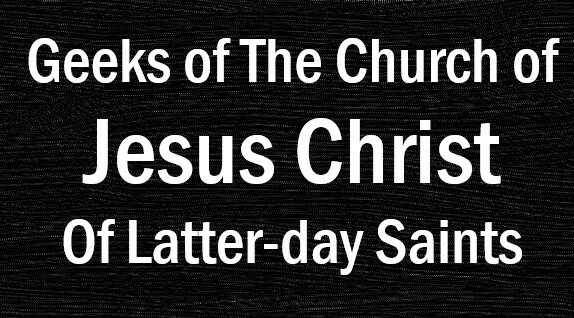 It sounds kind of silly but thing about it. If any character was to break into song of their own accord it would be Zelena right? Plus, she references in her song that she'll sweep into town after Regina is victorious. If she had been under the spell of the wish, she wouldn't have remembered that plan and yet she later found her way into the Enchanted Forest while everyone else was gone. What if Time Lords were really wizards? I mean, we’ve seen many magical creatures in Doctor Who… werewolves (multiple times), vampires (also more than once), hags, demons, and ghosts. Of course they turned out to be aliens…. But then wizards could be aliens too right? And the sonic screwdriver? A technological wand that even a squib could use. We know both wizards and Time Lords have longer lifespans than muggles. The only question is regeneration, since wizards don’t have that power. Well, at least not yet. Give them a few thousand years and we’ll see what happens. Oh and the Time Lord academy. Doesn’t it sound a little like Hogwarts? Either that or I’ll settle for JK Rowling being some sort of Time Lady. Why? I dunno, but it sounds cool. I've seen these on Facebook on and off and I like them. 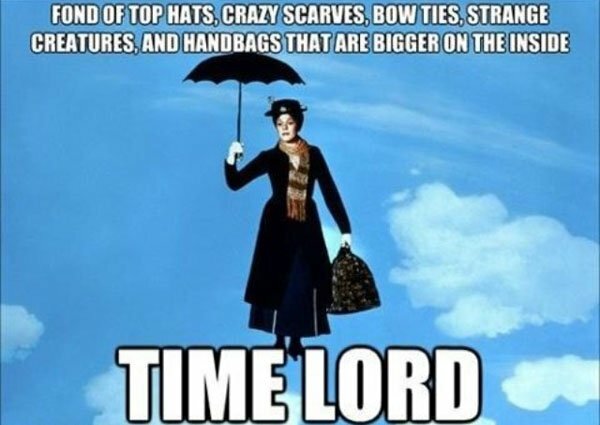 They're similar, so I'll lump them together: James Bond and Mary Poppins are Time Lords. It accounts for the many faces of Bond and it explains Mary Poppins's bigger-on-the-inside bag. Just think about it. That’s all. I’ve thought for years that the whole magical ability in Harry Potter is possibly genetic. Maybe it’s a recessive gene and squibs miss that gene? That would explain why after a few generations of squibs/muggles, you get a witch or wizard in the family as a surprise. So while they’re “muggleborn” they actually have some magical ancestry. I’m not a geneticist, but it made sense when I took high school biology. Anyone who has played the Pokemon games since Platinum would remember a mysterious character called the Looker. 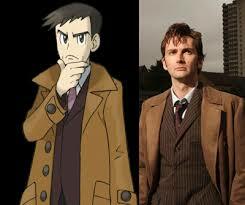 He looks awfully like the Tenth Doctor. Same outfit and he happens to study dimensional rifts (particularly in the later games). Could it just happen to be that David Tennant’s Doctor went to the Pokémon world once upon a time before he died to save Wilf? Who knows? So there are a few headcanons for you. Any cool headcanons you subscribe to? Any fun ways you like to crossover your favorite fandoms in your head? Let me know in the comments.